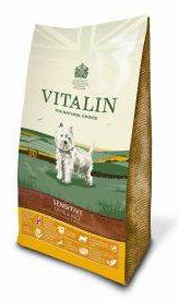 The 1950s saw Arthur Mills, founder of Kennel Nutrition Ltd, produce Vitalin Original, the first product in the Vitalin range. 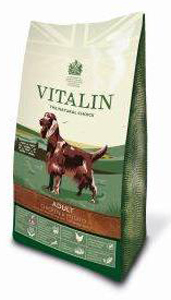 The name 'Vitalin' coming from 'Vital in' animal nutrition. The success was immediate, Original being the first commercially produced complete dry dog food in the UK. The products at the top end of the Vitalin range are really excellent, and easily fit into the 'natural' sector of the market, and unlike some brands these are not overpriced. They are based on a single meat source, easily digested cereals and naturally preserved. Lamb Meat Meal (26.0%), Rice (26.0%), Whole Maize, Maize Gluten Meal, Sugar Beet, Chicken Oil, Brewers Yeast, Whole Linseed, Fructo-oligosaccharides (Prebiotic FOS) (0.1%), Mannan-oligosaccharides (Prebiotic MOS) (0.1%), Seaweed (750 mg/kg), Rosemary (400 mg/kg), Green Beans (350 mg/kg), Glucosamine (340 mg/kg), MSM (340 mg/kg), Chondroitin (240 mg/kg), Extract of Yucca Schidigera, Dried Spinach (200 mg/kg), Thyme (100 mg/kg), Peppermint (100 mg/kg), Blueberry Extract (100 mg/kg). Additives Vitamins: Vitamin A 30,000 iu/kg, Vitamin D3 3,000 iu/kg, Vitamin E 125 mg/kg (as alpha tocopherol). Trace Elements: Ferrous sulphate monohydrate 200 mg/kg, Zinc oxide 139 mg/kg, Manganese oxide 80 mg/kg, Cupric sulphate pentahydrate 30 mg/kg, Calcium iodate anhydrous 2.45 mg/kg, Sodium selenite 0.22 mg/kg. Antioxidants: Natural. . Potato (30.0%), Chicken Meat Meal (26.0%), Whole Peas, Sugar Beet, Chicken Oil, Carrots, Brewers Yeast, Fish Meal, Fructo-oligosaccharides (Prebiotic FOS) (0.1%), Mannan-oligosaccharides (Prebiotic MOS) (0.1%), Seaweed (750 mg/kg), Rosemary (400 mg/kg), Green Beans (350 mg/kg), Glucosamine (340 mg/kg), MSM (340 mg/kg), Chondroitin (240 mg/kg), Dried Spinach (200 mg/kg), Extract of Yucca Schidigera, Thyme (100 mg/kg), Peppermint (100 mg/kg), Blueberry Extract (100 mg/kg). Additives Vitamins: Vitamin A 30,000 iu/kg, Vitamin D3 3,000 iu/kg, Vitamin E 125 mg/kg (as alpha tocopherol). Trace Elements: Ferrous sulphate monohydrate 200 mg/kg, Zinc oxide 139 mg/kg, Manganese oxide 80 mg/kg, Cupric sulphate pentahydrate 30 mg/kg, Calcium iodate anhydrous 2.45 mg/kg, Sodium selenite 0.22 mg/kg. Antioxidants: Natural. .